There are four cartons of eggs in my refrigerator right now, which might sound strange considering my childrens’ well-chronicled antipathy towards all things orb-shaped and yolk-filled, but as far as I’m concerned, it might not be nearly enough. The first carton, our standard Trader Joe’s Large Brown Organic, is almost depleted so that hardly counts. The second is one I picked up at our farmer’s market this past Saturday (Hallelujah! It’s open! ), and the last two dozen I bought at Stone Barns where we went for lunch a few hours later, because I couldn’t help it. Eating an egg from Stone Barns after a winter of Trader Joe’s eggs is like picking up Anna Karenina after a year of flipping through Archie comics. I needed to stock up. Those of you who’ve read Dinner: A Love Story, know that trying an honest-to-god, farm-fresh, deep orange-yolked egg for the first time back in 2002 — besides being an almost religious experience — was my entree into what was then the brave new world of cooking with fresh, local, organic ingredients. And like any good born-again, I’m always looking to spread the gospel. That extra carton will most definitely be a gift to someone who has given my kid a ride to the soccer tournament in Jersey or to a city friend who, like the rest of us, is dreaming of spring. Or to someone having us over for dinner. I’m telling you, these eggs are so good they are GIFT WORTHY. Speaking of dinner parties. Have you noticed that the deviled egg seems to be back as a starter option? 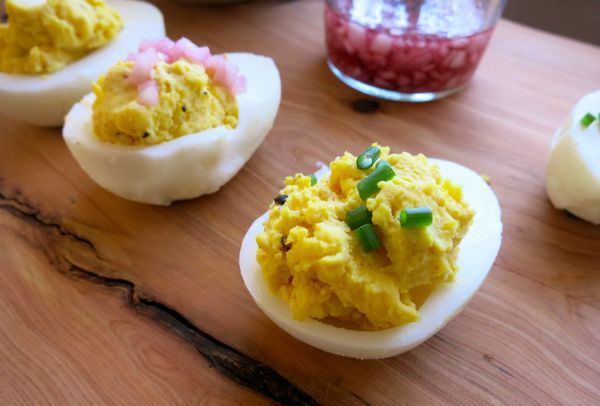 Though they’ve never been off my radar for a weekend lunch or a mid-day snack, or a serves-one dinner when I come home after hours, I started making them for friends at cocktail hour after spying Bon Appetit‘s bacon-scallion deviled egg recipe a few issues ago. Soon after, my friend Seth served us some topped with salmon roe, procured in the canned fish department of the local supermarket. I keep meaning to replicate that in my own house, but I won’t have to for a little while, because the eggs I have now (as with all fresh ingredients) do not need a lot of dressing up. I like a little mustard and mayo mixed into mine, plus a hint of onion, whether that’s snipped chives, scallions, or, my favorite, vinegar-macerated shallots. 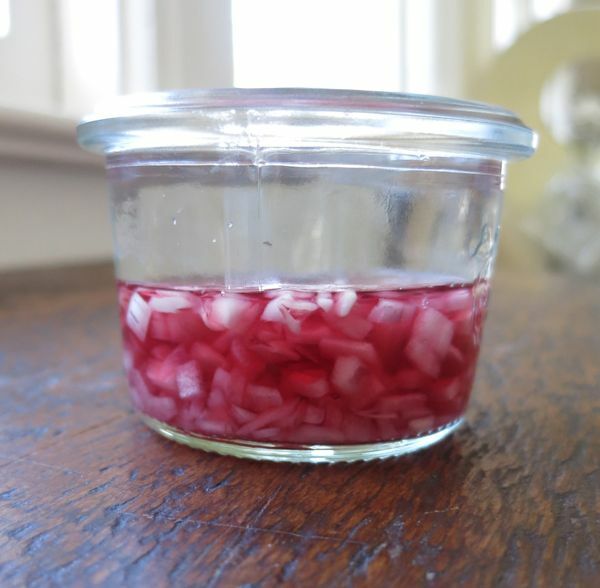 Because of the word “macerating,” this sounds very fancy, but it’s actually just what it looks like: minced shallots soaking in a jar of red wine vinegar. You only need to soak for 10-15 minutes to get the desired pickled effect. Ricotta and Greens Omelet, page 114 of my book. To remove shell: Once completely cool, gently tap your egg on the counter so the shell breaks apart. Pick off the shell carefully — in spite of the jagged pock-marked ones you see above, you’re going for a nice smooth white surface. (Detail work: Not my thing.) I find the shell slips off much more easily when the egg has completely cooled. Once the shell is removed, slice the egg in half horizontally and scoop the yolks into a small bowl. To make filling: For every 2 eggs I’ll add about 1 heaping teaspoon of mayo, 2 drops spicy brown mustard (I favor Gulden’s here) salt & pepper. Mash with a fork and mix in your macerated shallots (or snipped chives). Since there’s nothing I won’t add horseradish to these days, I’ll occasionally mix in a pinch to this, but that’s just me. As luck would have it, at Stone Barns, we ran into our friend Fred walking with his two beautiful dogs. In addition to being a design legend (or “virtuoso” to hear AIGA tell it), he is also an amazing photographer and took this shot above. Can you believe what he can do with the Hipstamatic app on his iPhone? These are the chickens that made this entire post possible. Thanks Chickens! Thanks Fred! Hey Jenny – we’ve found that our fresh eggs just don’t peel easily. Which is why you might have some issues with the ones from the market and the farm. I’d guess the Trader Joe’s ones will be much easier to peel. For peeling–I find a spoon with a flat-ish curve and slide that under the shell (it works best if you can get it under the membrane) and use that to lift off the shell from the white. Much easier, though you will still have a 5% stubborn egg failure rate; higher with really fresh eggs. Peel your eggs under cold, running tap water- very helpful for peeling fresh eggs (or leave them in the fridge for two weeks before cooking them). The water gets between the egg and the shell and makes it much easier to get the shell off. We’re having deviled eggs with smoked salmon and salmon roe as one of the appetizers at our wedding! They were really good when we tried them–and now I have to wait until October for more! Maybe I should try to make some at home? I do a very similar recipe for egg salad except instead of the shallots I add a little chopped pickle and some of the pickle juice. I’ll bet that would work just as well if you don’t have time to macerate the shallots. And I agree with Mollie. I find the fresher the egg, the harder the peel is the rule of thumb! I like all kinds of devilled eggs, but I think my favourite way has to be with some nice spicy lime pickle added to the mayo and yolks — creamy and tart and spicy all at the same time. Annnnnd now I’m off to buy more eggs. We just rented a house for a weekend away this summer and they have chickens and you can use the eggs! (and a smoker too!) Anyway, I can’t wait to taste those eggs, especially after reading this. 14 minutes! We hard boil ours for six! We’ve got a flock in our backyard and when you’re working with eggs as fresh as the ones you’ve got, slightly undercooking is delicious. Give it a shot! Love deviled eggs and eggs in general! Had to comment today and tell you that I made an older recipe of yours today–the Quinoa Breakfast Cookies. My children and are gobbling them up and No, it is not breakfast, and yes, it’s close to dinnertime! I’ve read that older eggs are easier to peel than super fresh eggs. Something about gases being emitted from the egg that is trapped between the white and that film underneath the shell while it ages? Also peeling it underwater, as others have said. I’m a die hard for fresh farm eggs too – I have 2 family run farms I buy from at the moment. Loved this post, so entertaining, and timely too! Thanks for the tip on vinegar soaked shallots, this will be my go to dish for Easter at the in-laws! So, we raise chickens and learned a trick to peel fresh eggs more easily. Just prick the end with something like a tack, not all the way through. My parents used to have an egg cooker that pricked the eggs when you placed them inside. It works like a charm for us. Going to try the shallots next go round – always looking to use up eggs ! yes, definitely try the spoon peeling method – seriously life changing! we are big hard boiled egg eaters in our home and it’s made my life so much easier and cut down on frustrated broken eggs. those pickled shallots look fantastic! I hadn’t realised that devilled eggs were experiencing a resurgence in popularity – fancy that! I like to make them with a bit of curry powder as well as mayonnaise – delicious! 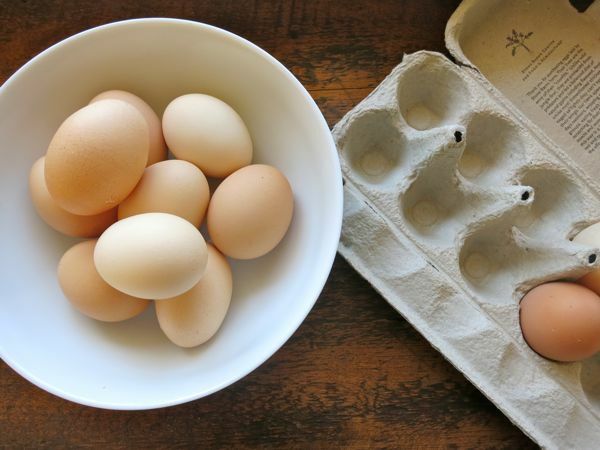 I have a vivid memory of my own first experience with fresh eggs – it is downright bizarre to eat something that you like and enjoy and then have it be sooo much better! I also recommend the tack through the fresh egg if you are hard boiling them. I cook my eggs exactly the way you do, and they are always perfect. I do cool them in an ice bath though to thoroughly stop the cooking. Old (fresh) eggs (an oxymoron?) are MUCH easier to peel. I’ve heard you could add baking soda or vinegar to the water to aid in easy peeling, but I have never tried it. I know this sounds weird, but I have found that eggs from Stew Leonard’s are much easier to peel. I don’t know what it is about them. Also they sell them in packs of 18 (extra large eggs, too!) and they are pretty cheap. I eat a lot of eggs, between quiche or frittatas for dinner, hard boiled for breakfast, and of course, deviled eggs for company. My husband’s specialty is egg and cheese sandwiches. What a beautiful website Stone Barns has. I am sure the farm is all that is says! I wish it were closer. A little far from Cleveland for a daily road trip. I love deviled eggs, not a big fan of mayo. So we ” cook with 2 chicks” recently posted on “guacamoled eggs”, they are simply delicious! Your farm fresh eggs are best for poaching 🙂 Older eggs peel easier when hard boiled. Love a good deviled egg! Fresh eggs are not the best for hard-boiling–they don’t peel well. Save the freshest ones for other uses and use ones that are at least a week old for hard boiled. 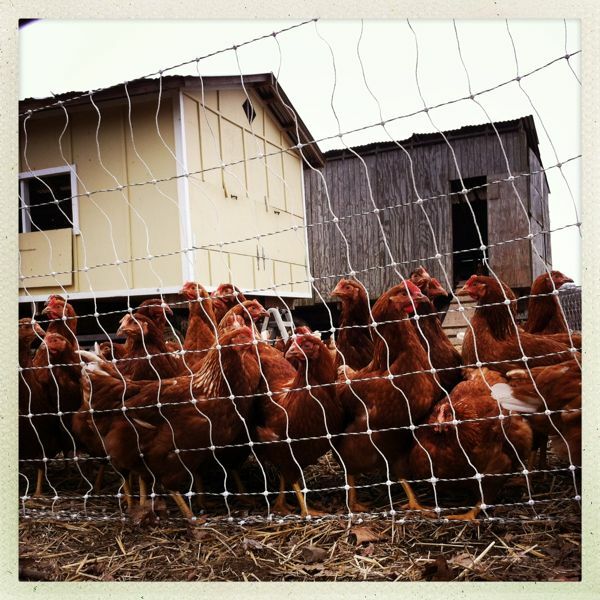 I’ve been ordering my local eggs from “Good Eggs” here in the SF Bay Area – fresh eggs delivered weekly! I’ve been making homemade mayo with them and it is so tasty! Would only make it with eggs I trust since the yolk is raw. Anyway, then I used that mayo to make deviled eggs with some curry spices and it was SO tasty! It got the idea from an article in Cooking Light with a dozen flavors for deviled eggs (from curry to mushroom to romesco, etc.). I know my kids like hard boiled eggs ok but they get so messy! Crumbly dry yolk gets everywhere! I have to see if they’ll eat deviled. I think I’ll try that guacamole egg idea since they love avocado! I started getting my eggs from the Farmer’s Market about a month ago and I just don’t think I can ever go back to a “normal” egg. Mmmm. So so good. I heard that the hardest to peel eggs are because they are the freshest. Either way, I find if I am able to grab that thin layer of skin (or whatever it is) then I am able to get the rest of the shell off without much trouble. My egg lady connection at the Farmer’s Market shared the trick to hard boiling fresh eggs: you steam them! Just place the fresh eggs on a vegetable steamer in a covered pot with some water. Once the water starts to boil, steam for 10 minutes and then take off the heat. They peel perfectly! Cool hard boiled eggs in cold water. Then whack the egg on the counter and roll it around under your flat palm. That will crack the shell all over….you may have to tap each end. Then you can peel eggs easily…..usually! Getting underneath the membrane helps. We just recently had a family member give us some fresh eggs. I made some French toast with them and it was honestly some of the best I’ve had. The yolk was such a rich orange color. Now if we could just get some fresh milk! I just read your excerpt about eggs from your book a couple of days ago. I’m not a huge egg person, but you have me VERY curious now. I’m on a mission to find me some farm fresh eggs. I am LOVING your book, by the way. LOVING. I borrowed it from the library, but it’s on my wish-list of cook books to own. I made the butternut/apple soup the other night. YUM! !